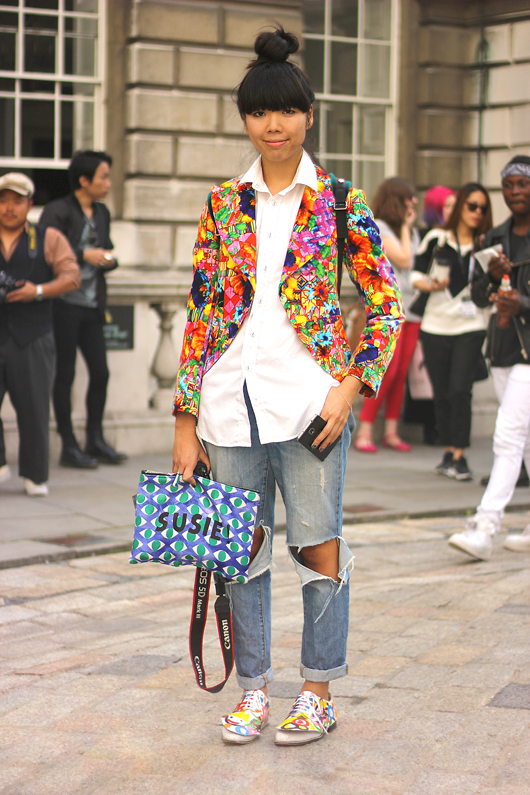 See the colourful & quirky parade of LFW SS15 attendees. 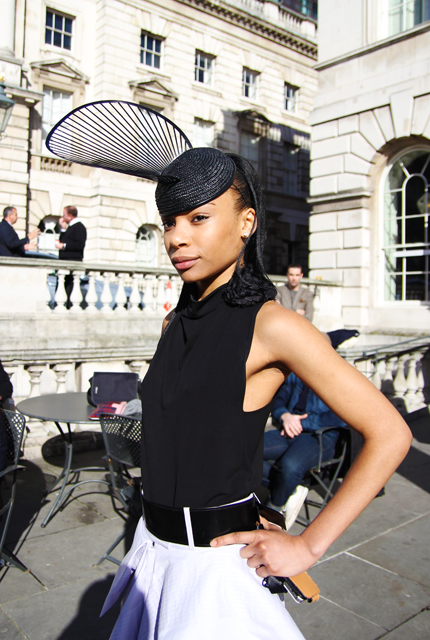 [dropcap]L[/dropcap]ondon Fashion Week was blessed with sunshine and with it came a gorgeous parade of SS15 show attendees. 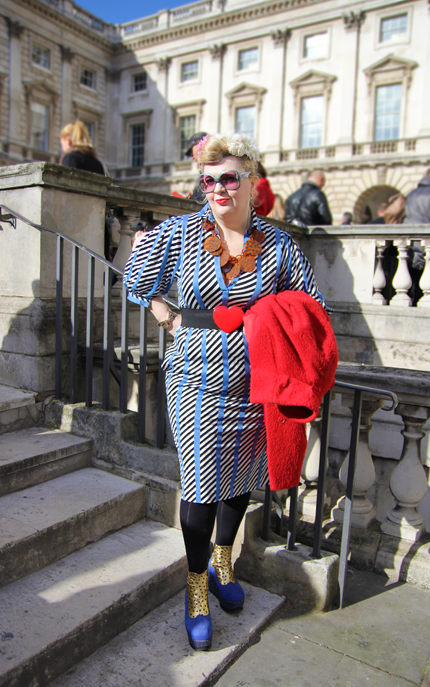 Here’s our favorite colourful and quirkily dressed peeps at Somerset House. Look out for some exclusive LFW pics on JC Decaux digital billboards in train stations and shopping malls across the UK. 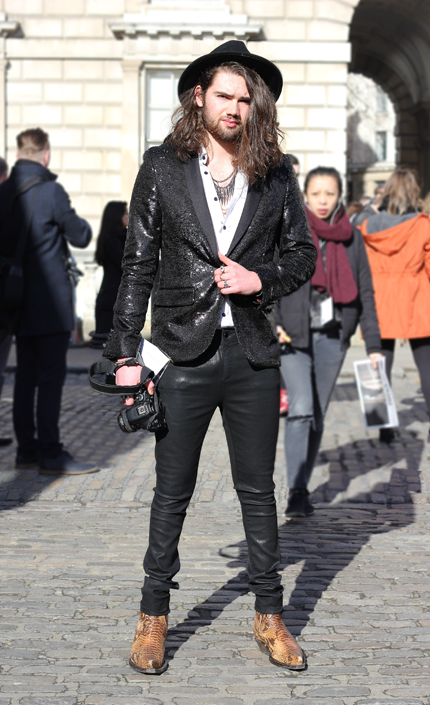 See more London Fashion Week street style. Fashion writer Susie Lau of Style Bubble wears Comme des Garcons jacket and shoes and a personalised Print All Over Me clutch bag. Abbey Clancy is an international model. She wears a Sibling skirt, Topshop crop top and L.A.M.B knee high boots. Lord Charles Cartier is a fashion student from Essex. 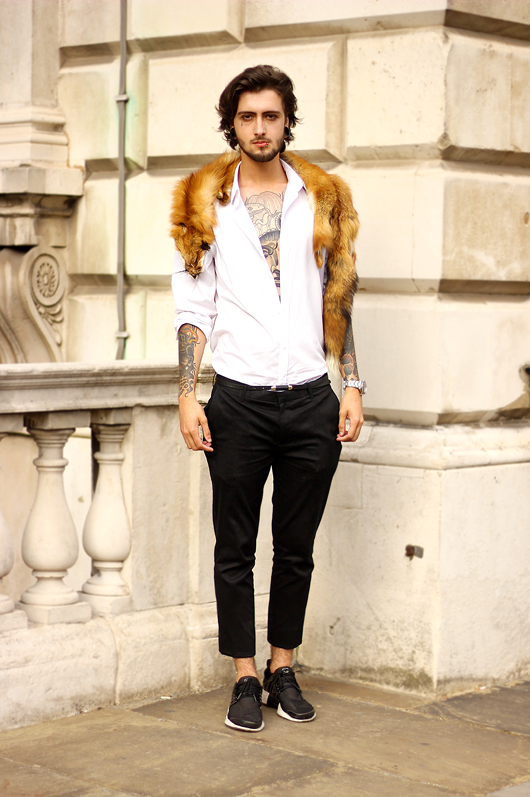 He wears a Versace shirt, vintage faux fox scarf from Canada, Topman jeans and Nike trainers. Payzee Mahmod is a stylist. She wears vintage trousers from Shoreditch, River Island top, and the rest from H&M and ASOS. Ramario Chevoy is a stylist, dancer and model. He wears a River Island hat, vintage bag, Alves London coat and Trousers, and Dr Martens sandals. 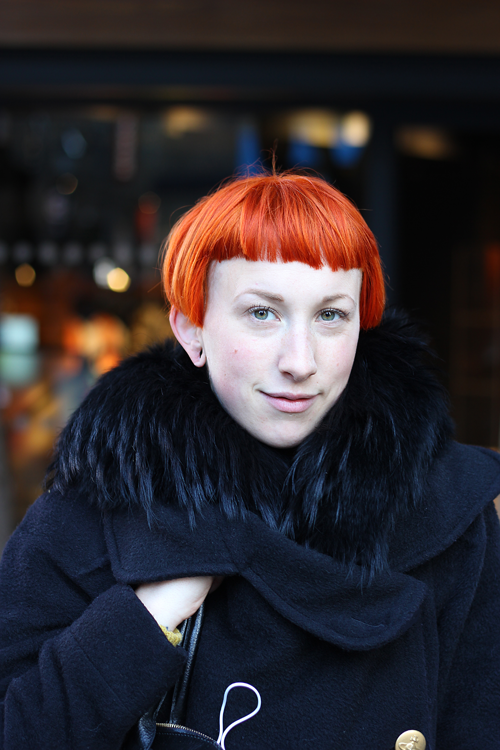 Tilly sleek style in AQ/AQ, Celine & Topshop shopping in London. [dropcap]T[/dropcap]illy Morris, a 19 year old retail supervisor from London, was pictured whilst shopping on Regent Street. We stopped to admire her gorgeous eyebrows, sleek black outfit and vibrant orange Celine handbag. She wears Topshop jeans and stiletto shoes and an AQ/AQ top and jacket. 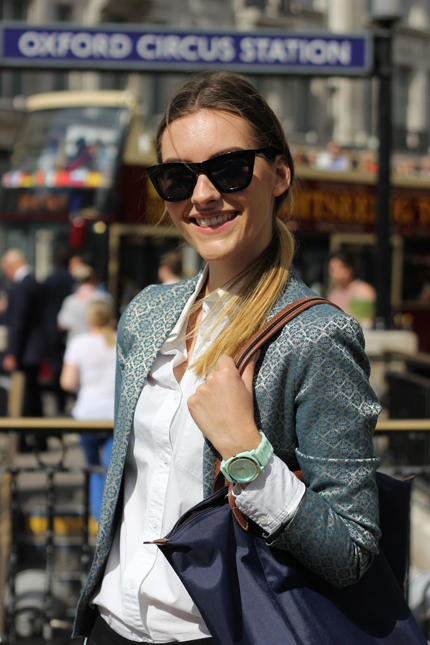 Julia Lawton on her way to a job interview in Oxford Circus, not surprisingly for a job in fashion. 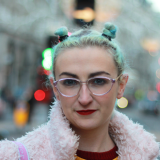 [dropcap]J[/dropcap]ulia Lawton, from Vancouver, was on her way to a job interview in Oxford Circus, not surprisingly for a job in fashion. She’s wearing a Topshop metallic blazer, Club Monaco shirt and trousers, Longchamp tote, American Apparel shoes, Topshop sunglasses and Anthropology watch. 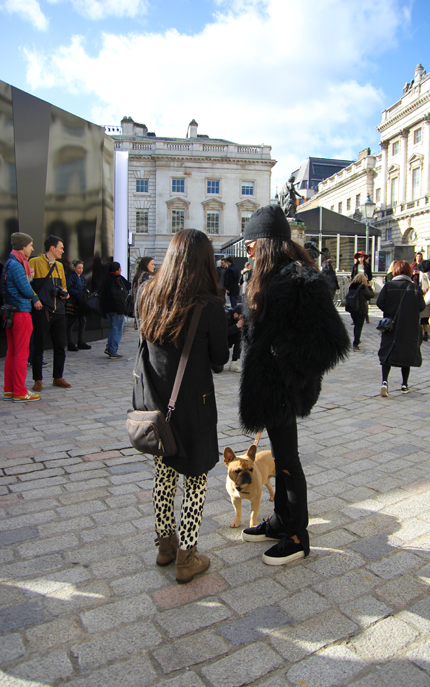 [dropcap]S[/dropcap]unday was the day to be at London Fashion Week A/W 2014, the sun finally made an appearance and the stylish ladies and gents were out to play in it. 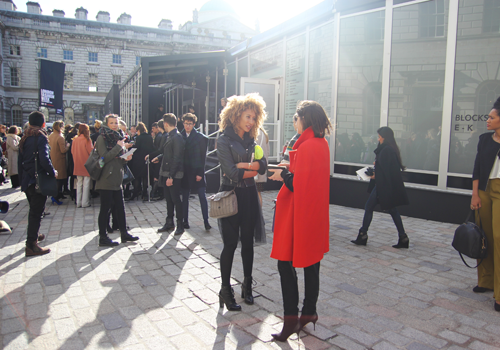 Trends on the courtyard included oversized circle and cat eye shaped sunglasses, floral jackets, buckle boots and sports luxe plimsoles, and lot’s of holographic, rose and yellow colours. 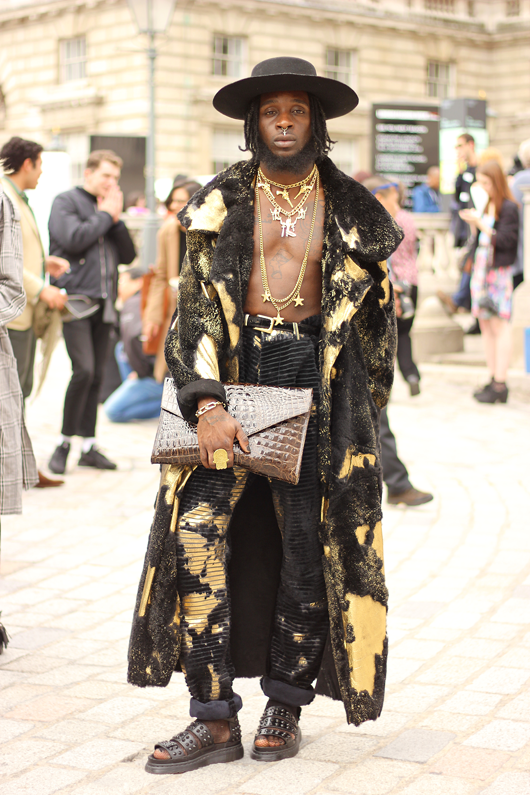 See more London Fashion Week street style. 2 Shoes 1 Pair blogger Naomi Roland wears vintage blouse and jacket from Beyond Retro, green skater skirt from Choies, Boohoo buckle shoes and Forever 21 sunglasses. See more of Naomi at LFW SS14. Gemma Talbot wears tartan coat, bag and sunglasses from ASOS, Topshop skirt and top, River Island shoes. Rosie Glow in Boohoo floral jacket, ripped jeans, buckle boots and a Kate Spade bag. Bronte Mccallum from Lion Lion Bazaar wears yellow Zara coat, Sass and Bide top, YSL bag and necklace made herself. Faiz Othman (left) wears vintage jacket, Zara trousers, River Island bag, Gucci shoes, Tory Burch bracelet and Ray Ban sunglasses. Lychee VDW is a jewellery designer and wears Burberry coat, Zara trousers, Comme Des Garcons shoes, Primark bag, Ray Ban sunglasses and Brian Lichtenberg cap. 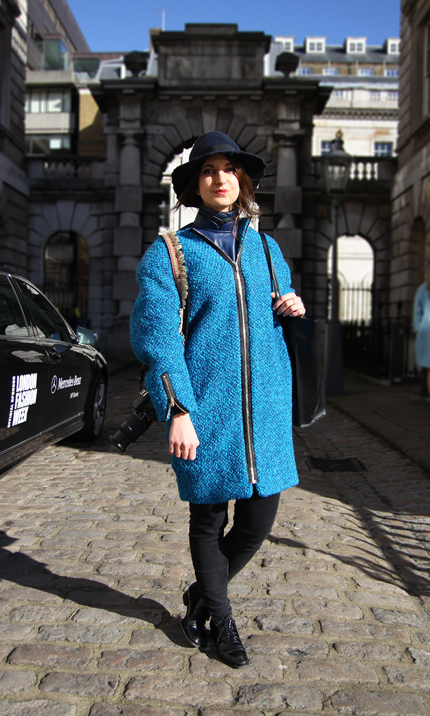 Berta Bernard is a photographer and film maker, she wears Sur coat, top, skirt and Zara bag and shoes. Chloe Louvouezo wears Anne Taylor jacket, BCBG trousers, Giorgio Armani bag and vintage shoes. Saskia Jung, stylist at Vintage Parrot wears MSCH hat and shoes, Rina Sciem trousers, Vibe Johansson jacket, Vintage Parrot coat and necklace and Zara sunnies. 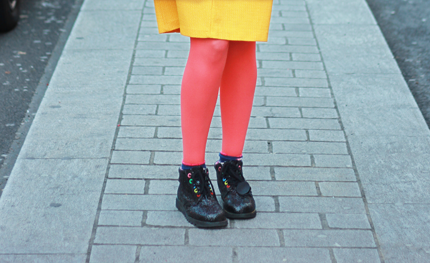 Maria Matveeva, Fashion student, wears Antipodium dress, Zara coat, And Other Stories shoes, Max Mara bag and Topshop head band. Clare Astra wears Topshop coat, River Island knitwear twin set jumper and skirt, ASOS plimsoles and sunglasses and Dorothy Perkins holographic bag. Fashion student Jessie Pink wears Zara faux fur coat, ASOS embellished jacket, trousers and top, Maya clutch bag, Zara holographic shoes and vintage sunglasses. Alex Phelps wears TK Maxx jacket, Topman jeans and boots from Camden. Maddy killick wears Beyond Retro clothes and holographic Underground creepers. 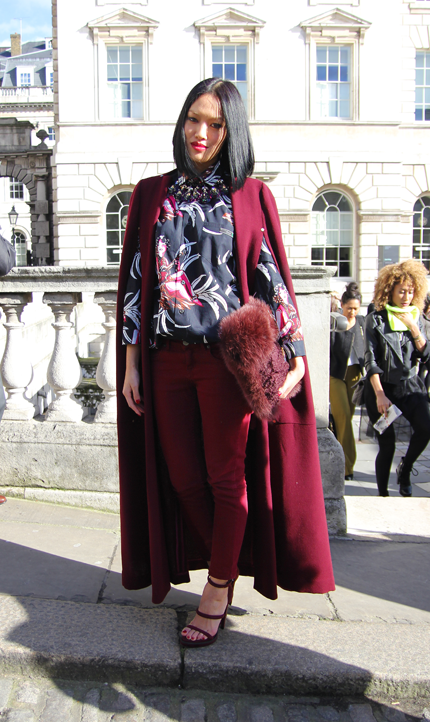 Larissa Hadjio, a fashion designer, wears Reality Studio coat and shoes and Larissa Hadjio trousers. Footwear designer Natacha Marro wears vintage clothes from Victim on Brick Lane, an 80’s necklace and shoes from her own range. Sabrina Carder, wears Topshop coat, Sugar Tips top, Bershka skirt, Missguided shoes and Primark hat and Claires bag. Irina lakicevic from Portable Package wears Proenza jacket, Acne skirt and Adidas trainers. 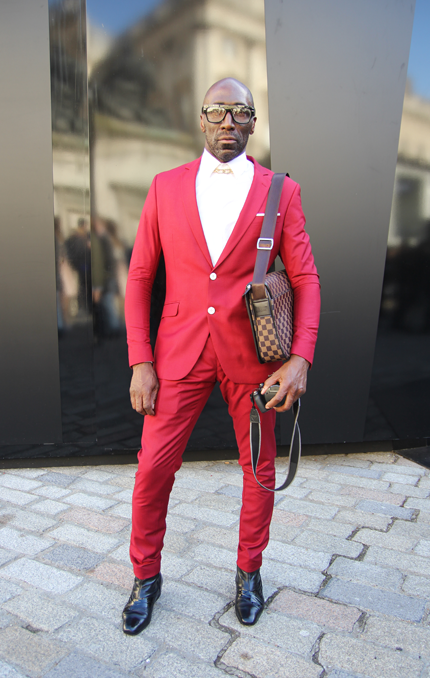 Photographer Deigh Alex wears his own suit, vintage shoes and a Louis Vuitton bag. 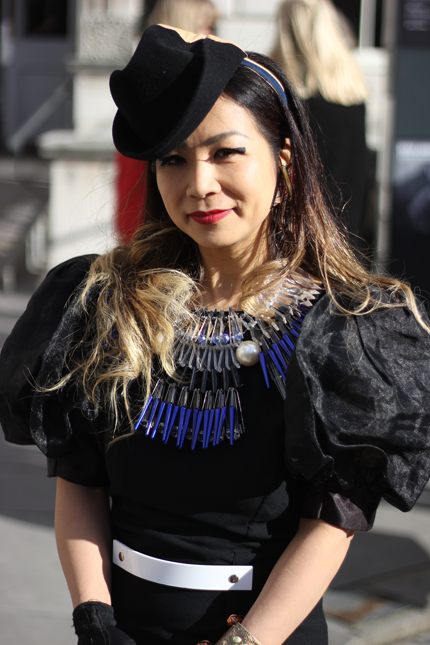 Tiffany Hsu, a buyer at Selfridges wears Marios coat and trousers, Prada blouse, Mawi necklace and Vani bag. Mei Hui Liu wears Vivienne Westwood coat, shoes Natasha Marro and clothes from her vintage shop Victim. Ma Malone designer wears Stella Mccartney dress, Caroline Fleming tights, Zac Posen clutch bag. Laura Mora wears Sur with vintage shoes and a Zara hat. Flo Busa wears Eskay W London. Jeanette wears Zara skirt, jumper from Hong Kong and a vintage coat. Thayviha Ashley works in PR for Boudicca and wears head to toe Boudicca. Samara Curtis-Quick, an assistant fashion buyer at New Look, in leopard print. 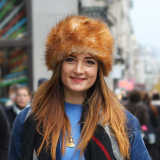 [dropcap]G[/dropcap]orgeous Londoner Samara Curtis-Quick, 30, is an assistant fashion buyer at New Look. 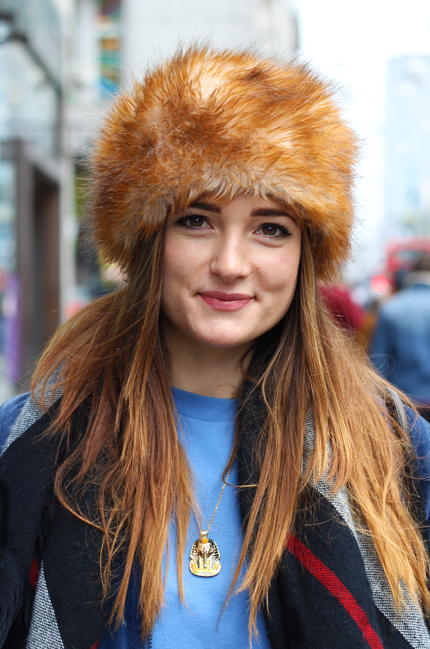 She was snapped while out shopping on London’s Oxford Street wearing New Look boots, a H&M bag and leopard print skirt, Topshop jacket, a vintage scarf and faux fur hat, finished nicely with her awesome eyebrows and ombre hair. Designer Natalie Anne Moran’s candy colours & blue hair. 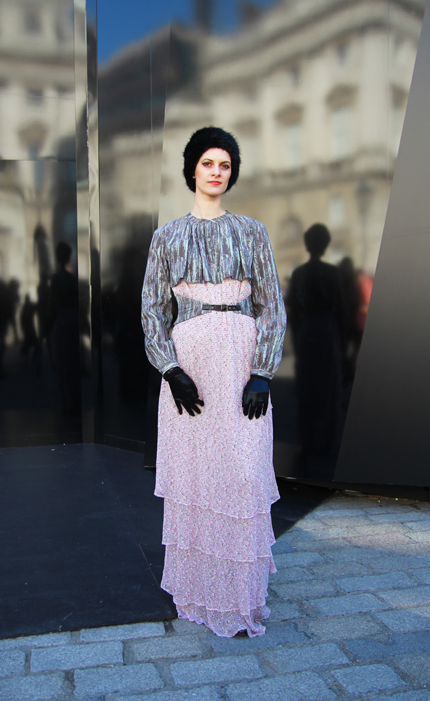 [dropcap]N[/dropcap]atalie Anne Moran’s candy colours stood out in the throng of Regent Street shoppers. 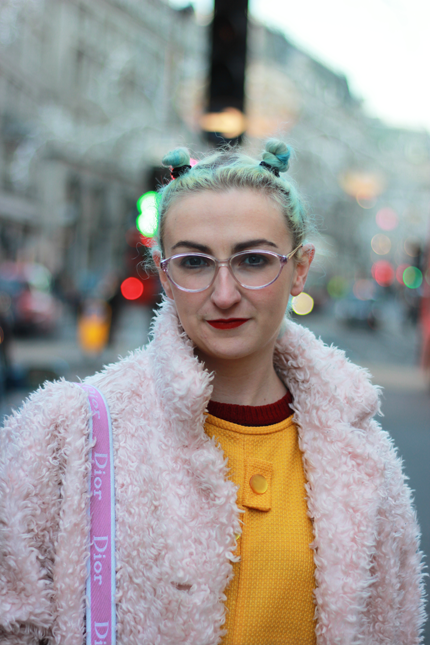 The 28 year old fashion designer from London wears a vintage dress and rose faux fur jacket, glitter Kickers boots and Dior bag topped off with pastel blue hair. You can shop and wear Natalie’s candy coloured creations from here.